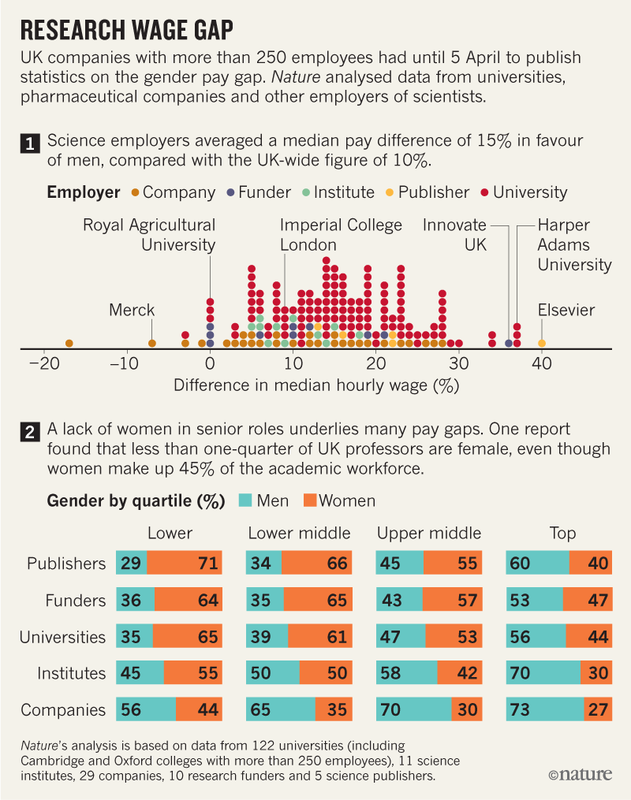 Many UK science employers pay women much less than men, and some institutions are far less equal than others, according to an analysis conducted by Nature of statistics released last week. Universities, pharmaceutical companies, funders and other science-focused organizations maintain a gender pay gap that is 50% greater than the national average for all employers. In 2017, the United Kingdom became one of the first nations in the world to require employers to report differences in pay between men and women. Organizations that employ more than 250 people must report details of their gender pay gap, the representation of men and women in each pay quartile and the gender breakdown of who receives bonus pay. More than 10,200 organizations have now uploaded data to the government’s portal for gender pay-gap figures. The gender pay gap refers to the difference in the average hourly wage of all men and women across a workforce. It is not the same as unequal pay, where men and women are paid differently for performing the same role, which has been illegal in the United Kingdom since 1970. To see how science shapes up, Nature analysed data for universities, research institutes, selected grant funders and some industrial employers (see graph). Science institutions fared poorly overall. Of the 172 organizations included in the analysis, 96% pay men more than women, according to the companies’ reported median pay gaps. Nationwide, 78% of all organizations favour men financially. The median gap between genders among science employers is 15%, compared with the UK median of 10%. The median offers the best representation of typical differences in pay, because it is not skewed by outlying high or low figures. The figures paint only the broadest of brushstrokes. Dorothee Bakker, a climate scientist at the University of East Anglia in Norwich, UK, says that she was surprised to see her institution ranked among the worst performing, with a median pay gap of 30%. Women are encouraged to apply for promotions and are represented at all levels in her department, she says. Ruth Gregory, a physicist at Durham University, which has a median gender pay gap of 29%, said that she was “both surprised and not surprised” by the data for her institution, which puts it last among the prestigious ‘Russell Group’ of research-intensive UK universities. Much of an organization’s pay gap comes down to how women and men are distributed through the ranks. Women are often over-represented in low-paid and low-skilled jobs, whereas men are likely to make up the bulk of workers in senior and high-paid roles. Stripping out non-academic roles from the university data would probably shrink the gap between male and female earnings, says Jeff Frank, an economist at Royal Holloway, University of London, in Egham, UK, who studies gender pay gaps in science. The median gender pay gap for all academic staff at UK universities is 12%, according to a report released in 2017 by the University and College Union. For professors at research-heavy institutions, the figure is 7%. The driving force for this pay gap, says the report, is a “very clear and continuous decline” in the proportion of women represented as academic rank increases in seniority. Across the board, 45% of the entire academic workforce is female, for example, but less than one-quarter of all professors are women. Lauren Couch, head of diversity and inclusion for the London-based Wellcome Trust, says the poor representation of women in senior science jobs could be, in part, down to a lack of job security during the early stages of a researcher’s career. “If that tends to have an effect on those who feel less confident, or those from more disadvantaged backgrounds, that sense of precariousness and not knowing what the next steps are will likely push more women and those from disadvantaged backgrounds out of science,” she says. The Wellcome Trust has a 21% median gender-pay gap, which it is seeking to close by training staff to help mitigate bias, and introducing fairer ways of recruiting, promoting and retaining women at senior levels. Couch says that this approach is important because her organization and other funding agencies act as the gatekeepers to science, and the Wellcome Trust could be missing out on supporting excellent ideas. Of the nine other funders Nature examined, three had non-existent or negligible pay gaps, including the Engineering and Physical Sciences Research Council and the Economic and Social Research Council. In the pharmaceutical industry, there is huge variation in the gender pay gap. One company, MSD (the UK subsidiary of Merck), has a 7% pay gap in favour of women; another GlaxoSmithKline (GSK), reports small differences in pay, which favour men. Meanwhile, Pfizer and AstraZeneca have more-typical gender pay gaps, at 18% and 13%, respectively. Across the 29 research companies that Nature analysed, oil and gas businesses, including those owned by BP and Shell, generally had the largest median gender pay gaps and the lowest proportions of women in the top pay quartile. Merck's pay gap report highlighted internal training to avoid unconscious biases in recruitment. GSK has an on-going commitment to improving the representation of women at all levels of business, the company said in a statement. Across the company, GSK has 40% or higher female representation on its boards and within management. There is one obvious way to abolish gender pay gaps. One UK university eliminated its professorial pay gap overnight — by simply boosting women’s pay, says Alice Chilver, head of organizational development at University College London, who heard the anecdote in March, at a conference in London that she organized on gender pay gaps.